Freshly-made farfalle pasta, sprinkled with flour to prevent it from sticking, ready for a pot of salty boiling water. Two months ago, I was going to throw the pasta machine out the window and be done with the whole homemade pasta idea. But those who know me, know I am tenacious (ok, stubborn). With each new attempt at spaghettis, angel hair, fettuccine, lasagna and ravioli I figured out another piece of the puzzle. From the frustrating beginning of sticky or crumbly dough, I pressed on until my fettucine strands no longer stuck together and the lasagna noodles no longer crumbled apart. And yesterday, Jack’s favorite: farfalle! I turned out a double batch cut from lasagne noodles and pinched together in the center to form perfect little bow ties. Then Jack upped the ante. The farfalle were boiled for three minutes and topped with a mix of sautéed onions, garlic and pine nuts and served with rockfish a la meunière. Oven-roasted brussels sprouts, orange slices and steaming cups of honeybush tea complimented the main entrée. Cloudberry sorbet made from berries we’d picked in late summer ended the meal perfectly. 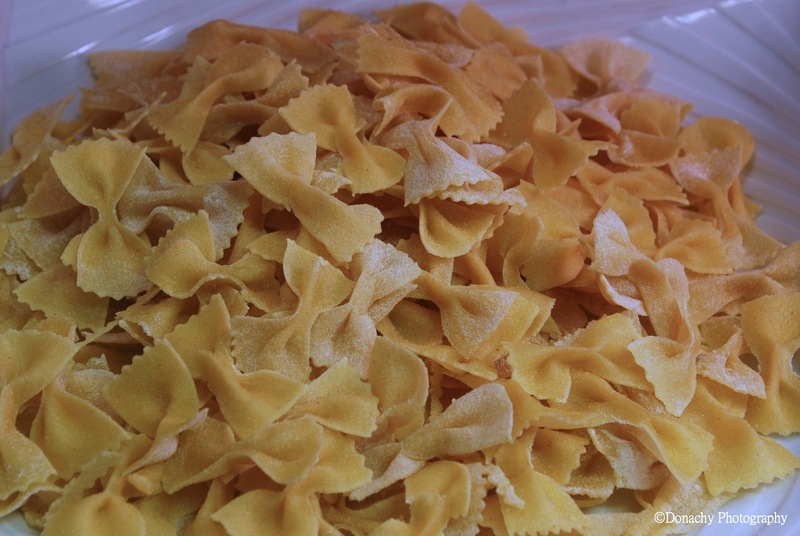 Bowtie pasta is my favorite,too…and cloudberry sorbet…sounds dreamy!